Nigerian herdsmen crisis: what’s at stake? Violence between Fulani herdsmen and farmers is one of Nigeria’s most persistent security problems and has left thousands of people dead in recent decades. The International Crisis Group think tank has warned it could become “as potentially dangerous as the Boko Haram insurgency in the northeast”. The clashes are driven by a range of factors from the environmental to political — but at their core is the problem of land scarcity. 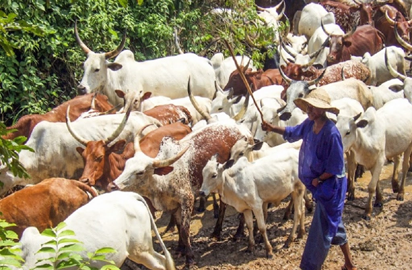 Climate change and the desertification of Nigeria’s north have forced the nomadic cattle herdsmen farther south to feed and sell their cattle, encroaching on the territory of sedentary farmers. Rapid population growth — Nigeria has 180 million people today and is set to become the third largest in the world by 2050 — has worsened the competition for land. For decades, herders and farmers mainly lived in peace. However as Nigeria grew, it became clear that for herdsmen and farmers to co-exist peacefully, something had to be done. In the 1960s, the government attempted to introduce legislation to guarantee migratory routes for the herdsmen and ensure farmland was respected. But the laws never were enforced, leaving communities to deal with disputes themselves. In recent years, the violence has increased, with some herdsmen carrying heavy arms and the farmers assembling militias. Both sides are now engaged in a devastating cycle of reprisal attacks, particularly in the central region. Each time there is an outbreak of violence the Nigerian government has promised to crack down on the perpetrators. But the reality has seen herdsmen and farmers take matters into their own hands to settle scores. “There’s no accountability, that’s the issue,” said Isa Sanusi, spokesman for Amnesty International Nigeria. Individual states are trying to introduce new laws with mixed results. In Benue state, where 80 people have been killed since the start of the year, a ban on open grazing angered herders who said it threatens their way of life. Nigeria is a country split almost evenly between a mainly Muslim north and a largely Christian south, and religious tensions bubble constantly below the surface. Many Nigerians — and especially lawmakers playing identity politics — have seized on the fact that the herders are mostly Muslim while the farmers are mainly Christian. President Muhammadu Buhari has warned against what he says is “simplistic reductionism” but he has been accused of not acting decisively because he is an ethnic Fulani. “This latest round of attacks has cemented the perception that the federal government, particularly the Buhari administration, is biased in favour of the herdsmen,” said political analyst Chris Ngwodo. Many feel Buhari is not addressing the herdsmen conflict as decisively as he did with Boko Haram jihadists and Niger delta militants. “Whether this is arising from incapacity or complacency or complicity is open to question,” Ngwodo said, warning the attacks could harm Buhari’s support at elections in 2019. The violence could be contained if the government focused on boosting security and enforcing legislation, said Azeez Olaniyan, a political scientist at Ekiti State University. A first step would be to arrest perpetrators, he added. “If the people had been apprehended earlier on and dealt with, we would have been talking about another thing entirely,” Olaniyan said. At the same time, legislation guaranteeing herders and farmers access to land has to be enforced. Unchecked, the conflict risks mutating into a greater security threat where ethnic groups are pitted against each other, Ngwodo said. The post Nigerian herdsmen crisis: what’s at stake? appeared first on Vanguard News.